Want to always have gaffers tape on hand but don’t want to lug around a heavy roll everywhere you go? 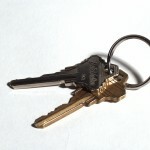 Strobist photography blog offers tips for creating a gaffers tape key chain using only a pencil and a paperclip. Click here for a step by step tutorial.